Passenger car registrations in Europe fell on a year-over-year comparison for the fourth consecutive months in December 2018. In fact, registrations have fallen year-over-year for four straight months in the EU, Germany, France, the United Kingdom, and Spain. Each of these jurisdictions shows four months in a row of registration declines while Italy is the exception with a gain in December and year-on-year declines in registrations for each of the previous three months. These results make it quite clear that auto sales in Europe are broadly weaker. Still, the three-month changes show that registrations have been picking up across the board over the past three months even in the context of lingering year-over-year weakness. A perusal of the data readily shows that this is because three months ago registrations were outrageously low. Despite the three-month rebound, sales are nonetheless still broadly weak and declining over six months. The graph makes all this rather clearer. These trends simply point up the volatility of the autos sector. In the far right hand column of the table, I adjusted for this by looking at sales over the past 12 months on average compared to the previous 12 months to that on average. That super-smoothed calculation shows overall European registrations up by 1.8%. Registrations are up in Germany, France, and Spain. Registrations are lower in Italy and in the U.K.
We can evaluate sales using two benchmarks. I use one long benchmark ranking sales since 1995 and a shorter one ranking them since 2008 in the period after the financial crisis. What is clear is that after the financial crisis, vehicle registrations everywhere were lower. For example, registrations today in Europe rank in their 39th percentile since 2008 but only on the 25th percentile since 1995. 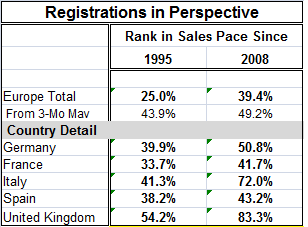 European sales are only in the lower 25th percentile of registrations when taking on a long view to evaluate them. When taking on the more abbreviated post-2008 view, however, they are still weak and rank only in their 39th percentile below their median pace for the shorter period (median would occur at a ranking of 50%). This evaluation marks current sales/registrations as weak even by the lowered standards of the post-great recession period. Weakness is not just apparent in the factory sector, but it appears to have spread beyond that in Europe. Compared to results since 1995, only the U.K. has registrations today above their long-term median pace with a ranking only marginally above the median at a 54.2 percentile standing. Compared to results since 2008, however, only France and Spain have a current registrations pace below their respective post-crisis median pace. The U.K. has registrations with an 83rd percentile standing; Italy has registrations with a 72nd percentile standing; and Germany barely goes over the median hurdle with registrations at a 50.8 percentile standing despite having the lowest unemployment rate in Europe. In addition to the slippage in these standings, we know that economic momentum has been fading. Often vehicle sales are an early casualty of a recession since as a big ticket item auto purchases usually are financed and lending activity is one of the first things curtailed in a failing economic expansion. The sharp slowdown in auto sales in Europe is therefore something to keep an eye on.